Below you'll find materials that can be used for promoting Moxie Magnus for your event. If other materials are needed please contact Lt. Magnus directly. (Special thanks to the WONDERFUL and TALENTED Jennifer Spurgin. 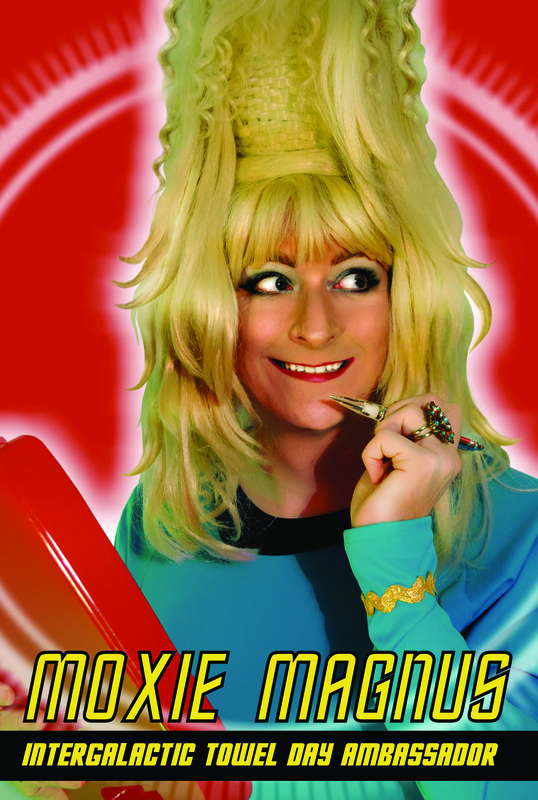 Lt. Moxie Magnus, the chief cosmetologist on the USS Enterprise under Captain under James T Kirk travels through time and space to deliver her own brand of sci-fi comedy stand up along with cosmic ukulele tunes! 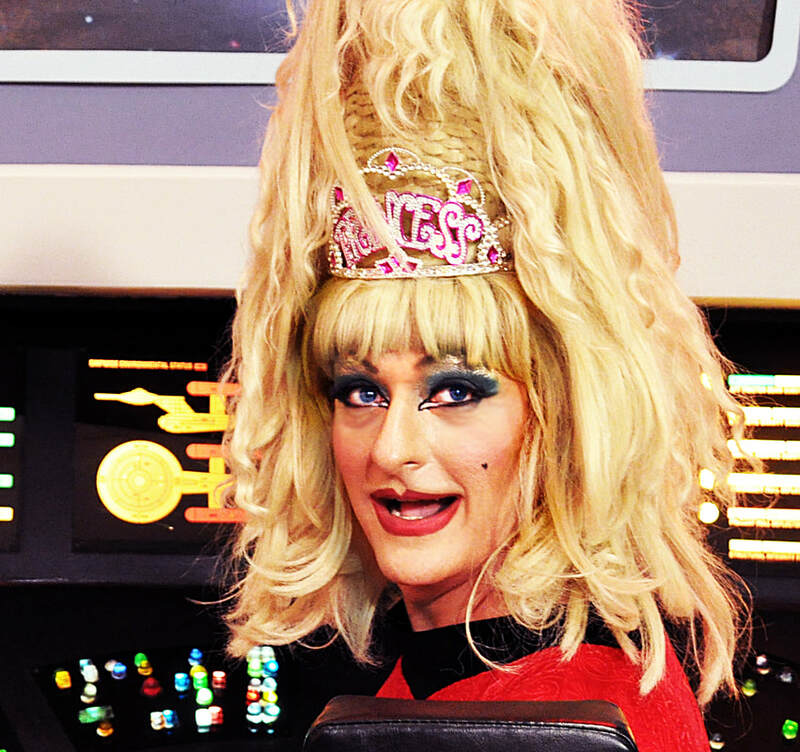 She's proof that your physics professor was wrong; there IS drag in the void of space! LT. Moxie Anne Magnus, entertainer extraordinaire, mediocre comic and even mediocre-er ukulelist, sling-shots back in time to join you once again! But who is Moxie Anne Magnus? She is indeed a riddle, wrapped in a mystery, inside an enigma, laced up in a girdle, topped with two feet of hair and set on a pedestal of size 12, Starfleet-regulation, black, chunky-heel, platform boots! 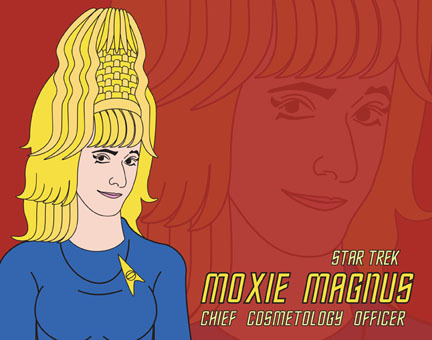 As the Chief Cosmetologist on the USS Enterprise of the twenty-third century, She keeps the crew's dos in tip-top shape. But what more do we know about this magnificent creature who has often been called "the petite bird of the galaxy"? 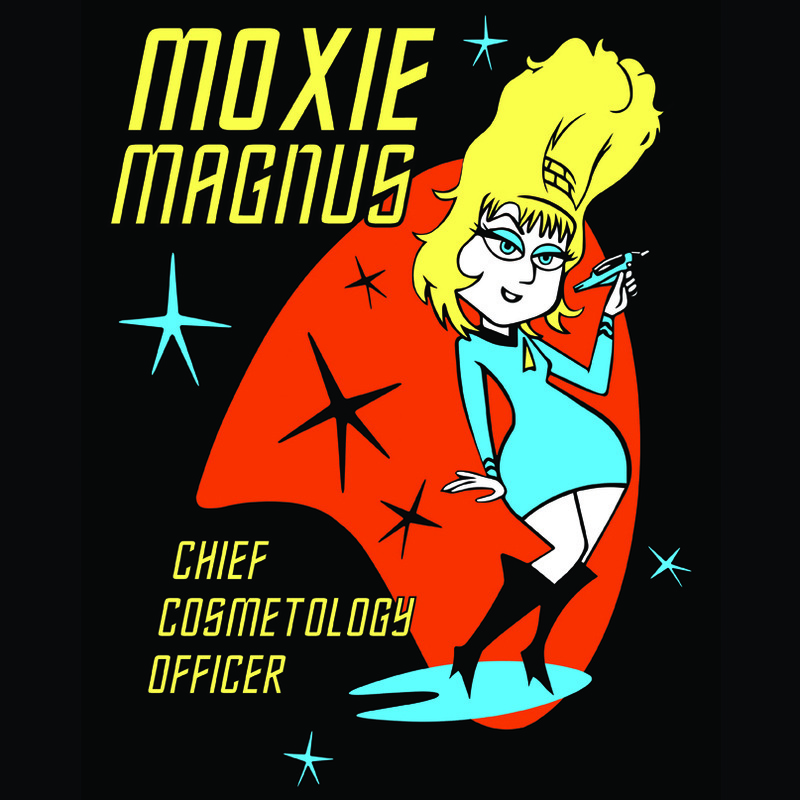 Here in the 21st century, Moxie travels throughout the US performing as the Queen of Outer Space. She’s performed at many cons including Outlantacon, Timegate, and Timelordfest. 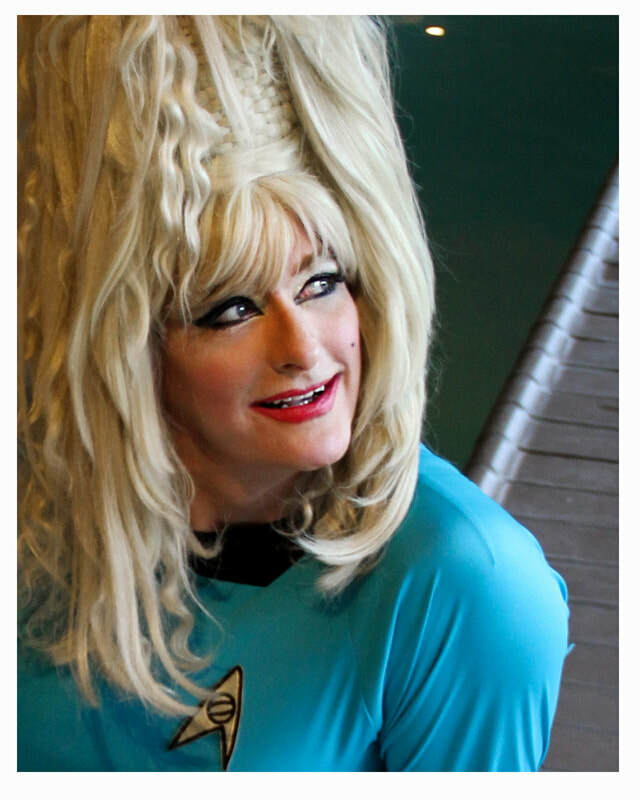 She’s acted as Con emcee at Indianapolis’s Starbase Indy and InConJunction, and at Cleveland’s Concoction, and even manned the “Bridge Float” in Iowa’s famous Trekfest parade. 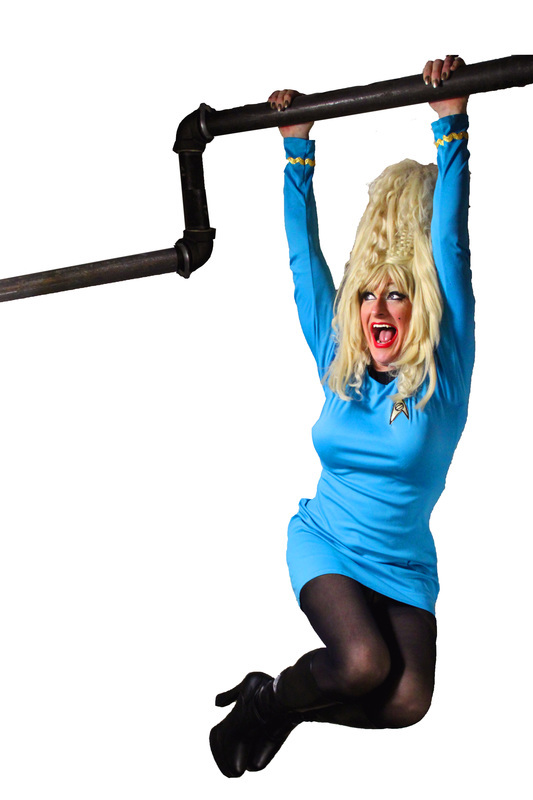 She’s played in clubs and theaters up and down the east coast including a run of Time-square cabaret shows coinciding with New York’s Comic Con. When she’s not performing she is working on her weekly web comic Tales From Salonbay. In recent years she has perfected the art and science of sling-shotting around the sun to arrive with a precision greater than renegade Timelords, Terminators, or even mad scientists with tricked out DeLoreans. As the self-proclaimed queen of outer space she comes in peace! Her jokes will make make you groan, her ukulele playing will make you moan, but her glamour will make you forget your pain!